Wildly kaleidoscopic and furiously cinematic, Home After Dark is a literary tour-de-force that renders the brutality of adolescence in the so-called nostalgic 1950s, evoking such classics as The Lord of the Flies. Thirteen-year-old Russell Pruitt, abandoned by his mother, follows his father to sun-splashed California in search of a dream. Suddenly forced to fend for himself, Russell struggles to survive in Marshfield, a dilapidated town haunted by a sadistic animal killer and a ring of malicious boys who bully Russell for being “queer.” Rescued from his booze-swilling father by Wen and Jian Mah, a Chinese immigrant couple who long for a child, Russell betrays their generosity by running away with their restaurant’s proceeds. 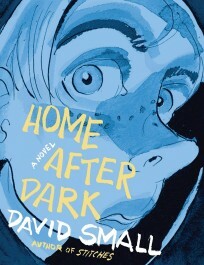 Told almost entirely through thousands of spliced images, once again “employ[ing] angled shots and silent montages worthy of Alfred Hitchcock” (Washington Post, on Stitches), Home After Dark becomes a new form of literature in this shocking graphic interpretation of cinema verité.